It is scary to think that our personal care and beauty products could be at the root of our illness or disease. We all tend to put trust into the FDA to regulate what goes into our products, but you would be appalled if you knew what was allowed in our shampoo, makeup and deodorants. There are thousands of chemicals found in our products, many of which can be absorbed by the body. So, it is time to start looking at your beauty products, the same way you look at your food labels. Lianne will help guide us through the top 10 toxins we need to avoid in our everyday beauty and personal care products. Hi everyone. Thank you so much for joining us for our second episode of Health Talk by Doctors Health Press. Now, if this is your first time joining us, I definitely recommend going back and listening to our first episode, with our interview with James Palow. He really gave our listeners some great information on how to stay healthy using what he calls the five pillars of health. So, you definitely don’t want to miss that episode. Now, like I said, if this is your first time here, let me just give you a little rundown about what this podcast is all about. We’re going to be bringing you some interviews with really the best in the field of healthcare and we’re going to be discussing pretty much anything and everything that could help to improve your health. We’ll be talking about ancient remedies and we’ll be bringing you some of the latest research in alternative health care and really everything you need to know to prevent illness, maybe reduced symptoms of disease and really overall live your healthiest life possible. You’re listening to episode two. My name is Sarah Cownley and I’m going to be your host today to help guide you through this show. The title of today’s episode is the top 10 chemicals found in beauty and personal care products to avoid. Now, I’m so excited for today’s show because we’re going to be discussing something that I think is just so incredibly important for helping to avoid chronic illness, but we really rarely ever hear much about it. Yes, sure. We, we often hear about eating organic foods and we are, we’ll know we have to exercise and get enough time outdoors, all of this to stay healthy. But what we do often overlook are these products that we’re putting on our body on a daily basis Whether it’s so shampoo, makeup, even our deodorants, they, they all could have toxic chemicals lurking these products and these all could actually be wreaking havoc with your health. I was actually just reading an article recently that was explaining how some of the top 10 shampoos that we all use, has now been shown to be causing Alzheimer’s and even cancer. Now, how incredibly scary is that? I mean, a daily product that we use everyday with that would even thinking about it can be full of all of these toxic chemicals that really just could be detrimental to our everyday health. So after I read this article about the shampoos, I started to wonder, okay, what else is in these other products that I’m using every day? So I started with my face cream. I looked up the information about that and found to my horror the amount of toxic chemicals that are found in this products that I’m smothering on my face day and night. It was some of the worst, that’s known to cause a lot of chronic illness. So if you’re suffering from any real health issues, maybe one of the first places that we should all be looking is to our products that we’re putting on ourselves every day. Now, joining us today is someone who knows just how harmful these everyday items really can be. Leanne Shepherd is a natural cosmetic specialist who’s really dedicated her career to exposing those toxic chemicals found in a lot of the products that we all use on a daily basis. Leanne is a natural product advocate and she teaches others the dangers of the toxins found in cosmetic and personal care products. So I’d like to welcome Leanne to the show. Thank you so much for being here and sharing all of your knowledge with us today. Thanks for having me. Sarah. Now Leanne and I have known each other for a few years and we have worked together before a few times. And Leann, I have to say when I hear you speaking to people about the chemicals that are found in our everyday products, I just shutter to think about what I’m putting on my body every day. And that’s why I thought this was such an important topic to cover. I just think it’s so important to get the word out there. And, you know, a lot of people are suffering from health issues and they just can’t find the root of the problem. So maybe this is what they’ve been looking for. You’re exposing some pretty serious health risks with these products. So how did you get to know about these harmful ingredients that are found in all of these cosmetics, soaps, shampoos and different products that we’re using every day. A bit of my background. I spent 15 years owning and operating a business in which I provided esthetic services, makeup application, nail services and so on. Part of the business was retail, so I would attend trade show events to seek out new brands and I would learn about their products and formulations. In the beginning I was more concerned about how these products performed, not necessarily on their ingredient list. Over time I started to research more and educate myself on the ethics of these ingredients and then I found myself fall down the rabbit hole, so to speak, and articles on risks associated with cosmetics and personal care products that contain certain ingredients. So from there I continued to investigate more and dig deeper. Now Lianne, are there no regulations on these products? I was really assuming there’d be an approval process before these products are really allowed in the public for sale. There are regulations, but there are gaps also. Here, for example, right off the FDA website, it states companies and individuals who manufacturer or market cosmetics have a legal responsibility to ensure that the safety of their products, neither the law nor FDA regulations require specific tests to demonstrate the safety of individual products or ingredients. The law also does not require cosmetic companies to share their safety information with the FDA. And then it goes on to continue that they’re asking these companies to do their testing on their own. So this leaves it up to the manufacturer, which creates a gray area. Now there is a list of ingredients that are prohibited. However, what I’ve discovered is that there is a certain percentage of ingredients that are considered safe for use in products. However, what we failed to look at is what happens over repeated use over the years. How much of these ingredients are a startup in fat cells that the body doesn’t recognize or know how to eliminate. What chemicals have shown up in breast tumors. How, what we inhale effects our whole factory system. What signals does it send to the brain? You know, what about liver, our liver and how hard it works to flush these toxins out of our body, so there’s so many things that we have to take into account. Wow. That’s sounds pretty scary actually, when you. When you really start explaining it like that. Now I know that there are the all of these toxins found in our products, like you just explained, but for the sake of not having this podcast run on for many hours. Although I know there’s just so much to discuss, we could go on, but for now, can you just give us a rundown, let’s say of the top 10 chemicals that we should be avoiding in our in our daily products. Many of your listeners have probably heard of some of these and they become well known in the media, so truthfully, I believe there to be so many, but we’ll try to think about the ones that come to mind. The first ones are parabens and the National Cancer Institute website states that some research has focused on parabens, which are preservatives used in some deodorants and antiperspirants that have been shown to mimic the activity of estrogen in the body cells. It has been reported that parabens are found in breast tumors, but there’s no evidence necessarily that they cause breast cancer. And this is just scraping the surface because they mentioned fragrance recipes are considered trade secrets. So manufacturers are not required to disclose fragrance chemicals and the list of their ingredients. Oh, so that’s how they get away with a lot of it. Exactly. And the European Union, it has restrictions on their use because they mimic estrogen and the interview with hormone function. There have been studies done that indicate that methyl parabens topically reacts with UVB rays leading to increased skin aging DNA damage. Another one is toluene. It’s otherwise known as methylbenzene or methylbenzyl is found in nail products on the National Institute for Occupational Safety. Here are the side effects, irritation to the eyes, skin or upper respiratory tract, drowsiness, confusion, anxiety, muscle fatigue, liver and kidney damage. And the list goes on. Another one is BHT, which is butylated hydroxy toluene, which is somewhat of a derivative from totally when itself. It’s a masking agent, so first scent in a product, and it’s also a preservative according to the Canada domestic substance list, it is classified as expected to be harmful and toxic and is rated as cautionary on the environmental working group’s website. Retinyl palmitate, because all of us want to fight the signs of aging is a synthetic form of vitamin A. it’s reported that it can speed up cancerous legions and tumor growth when in contact with sunlight. We’ve all probably heard of SLS, sodium lauryl sulfate. It’s their foaming agents. So they’re usually in cleansers or body washes and shampoo. Actually, I have heard people say before that, the more your product foams up, maybe the more you should be worried about it because that’s not natural. Absolutely. There are plant based versions of this, but it’s the sodium lauryl sulfate, sodium laureth sulfate that come up the most when it comes to organ toxicity, neuro toxicity, endocrine disruption mutations, and even cancer. Mineral oil. You don’t see this, it was definitely more popular in the seventies and eighties. It gives a moisturizing effect on the skin, but it clogs your pores, thus preventing them from eliminating toxins, and our bodies these days can afford to store toxins as they affect our overall health. There’s another one called DPB. It’s dibutyl phthalates, and there are many derivatives of dibutyl phthalate, so it’s really important to, you know, recognize them and do your research. It’s a fragrance ingredients and it’s a solvent. It’s rated on the environmental working group’s website as a 10 which is the highest rating and the red zone of toxicity. And even the state of California and other authoritative bodies have classified DVP as a reproductive and developmental toxicant and the European Union banned the use of the ingredient in cosmetics and personal care products. So it’s, prenatal exposure to DBP has been associated with anatomical changes in the reproductive system development in baby boys, in adult men it has been correlated with changes in serum hormone levels, lower sperm concentration, mobility, and decreased fertility. It’s another endocrine disrupter, organ system toxicity. And it does register as a bioaccumulation in the body, so it does get stored up in our systems. So artificial colors and dyes, a lot of them , of the F,D, and C colors which are derived from coal tar, which is a byproduct of the petroleum industry. Many are considered safe by the FDA, however, do your research as some are known to cause cancer and contain lead and arsenic. Wow. That’s kind of scary! You never think that you are putting lead or arsenic on your skin. Right? Exactly. Hydroquinone as a lightening agent, so it tends to be in, I don’t want to say, I see it more in women’s, you know, cosmetic products were like if they want to get rid of scar damage or hyperpigmentation from sun exposure. It has restricted use, but it is a known allergen when it comes to your organs and is classified as expected to be toxic or harmful. So that’s another one I would stay away from cause as we age, we tend to be looking at all these products because of the damage that we’ve done over time. Right, we’re looking at these anti-aging skin, lightening products, pigmentation removal, that kind of thing. All right, so there’s another one called diazolidinyl urea which is an antimicrobial preservative. It actually works by forming for formaldehyde in the cosmetic products. So when people are exposed to this, they may develop allergies to that ingredient or to any other type of formaldehyde producing ingredient. So it, there’s lots of evidence that shows that it’s a human skin toxicant or allergen and we all know that formaldehyde is toxic. Wow. Leanne. Okay. Well, you’ve definitely given us a lot to think about and, God, I never would have thought all of these toxic chemicals could be in our daily products that we’re smothering ourselves in really from our shampoos to body lotions. It’s really scary. Now, one question I did have for you, is about sunscreen now. I’m one of those girls. I can’t go outside, you know, for more than 10 minutes without looking like a lobster. But I’ve heard a lot of controversial arguments surrounding sunscreen. I know some say it’s full of cancer causing chemicals and others say you’ll get skin cancer if you don’t use it. So what is someone like me supposed to do, are there toxic chemicals in the sunscreen or should I be avoiding it? What, what would be your best advice for someone like me? I think over the years there’s been a lot of controversy and back in the days there was an ingredient called PABA. And we all been told stay away from PABA and conventional sunscreens and we hear all about skin cancers reported with the use of conventional products and with no use of sunscreen. What I believe to be true and studies, nature, animals, they all show that we do have a need for sun exposure. And in short, it stimulates the vital vitamin D production in our bodies. So moderate sun exposure is technically good for us. Without sunscreen, for you per say, early morning before maybe 11, 11:30, and then after 3:00 PM, I think it’s important that we all use wisdom based on where we live. You know, our skin type, you know, however, if you’re going to be on the beach for the day because there are really great natural sunscreens on the market that contains zinc oxide or titanium dioxide, which are minerals that provide great sun protection. Maybe once you’re done all your research on that we need to have you back on the show. So now you’ve been telling us about all these harmful chemicals, but what do we use instead of these products that are filled with them? I know when I go to the drugstore, I’ve seen commercial, natural brands popping up in a lot of the shops lately, but they’re still made by the same manufacturers, I’m guessing, as the so called dirty products. So can we really trust those so called natural ones to be clean? You need to be your own advocate and please, please, please read the labels of things that you’re buying. Nobody is forcing you to purchase these products. And yes, we do put a lot of trust when we even walk into a natural health store or a natural beauty store that everything is going to be legitimately in our faces. Right? So I think it’s good to become more savvy on ingredients and if you’re not sure, ask. I tend to, you know, see a brand, be curious and then I’ll dig a little deeper, do some research, get on their website. If something is fishy, I’ll call them and ask for clarity. You know, there’s an environmental working group. A lot of these products are registered with them so you can check them out. So there is a ways to go about doing that because I still, I still see some natural brands that even they might contain a certain ingredient that is deemed to be slightly toxic, but it’s in such a low percentage in the product and although it’s not, you know, something that maybe accumulates in your body, it’s still something that you have to think, do I really want to expose myself thought to that on a daily basis. So we really have to be our own advocate, really look into things ourselves to be sure I’m in this day and age, right? Nobody’s looking out for us. Really for better health, we really need to do it ourselves. Okay, well Leanne we can definitely say you’ve certainly opened my eyes to the potential health risks that could be in a lot of the products I’m using every day now. If you could just leave our listeners with one tip to take away. I know we can’t expect everyone to go into their bathroom now and throw all of their products at once and start again. So what would your tip be to start to avoid these harmful toxins? Okay. So the first thing is, is look at what you’re using. Consider the products that you use every single day. Replacing those ones. So like toothpaste, deodorant, body lotion and your face, care. These, the ones I would target first. Look at those labels. If you’re seeing a lot of things other than that, no good pitch it. It’s your health is, it’s not worth it. It really isn’t worth it for, you know, it might cost you 30 bucks to replace those things and unless you’re using a really high end skincare line for all those ladies fighting lines and wrinkles, but your basics, your toothpaste, deodorant and body lotion, do those first. And for a woman first and foremost your lipstick as you basically end up eating most of it. But I follow in 90 slash 10 approach or I would probably drive myself crazy because in the very beginning I did empty out the entire bathroom and started from scratch and most people can’t afford to do that so I do my best to keep my percent clean and I reserved that 10 percent grace period for my favorite red lipstick. I wear once in a while, but truthfully if that lipstick came up in the red zone on the environmental working website, I would still have to pitch it. Okay. So we need to check our labels. Maybe start shopping at these more natural health food stores and seeing what products they have instead of just going to the local drugstore and picking stuff up we would usually grab off the shelf. I know I, for one, I’m going to start checking my labels more carefully now when I purchase my products and maybe checking out some of these, you know, natural cosmetic stores, it really is scary to think of just how many chemicals applying to my body each day. Now I’m sure you’ve also convinced a lot of our listeners to start purchasing more natural products and start paying attention to the ingredients listed on the products that we’re all buying each and every day. Now, Leanne, thank you so much for joining us today and sharing your knowledge. 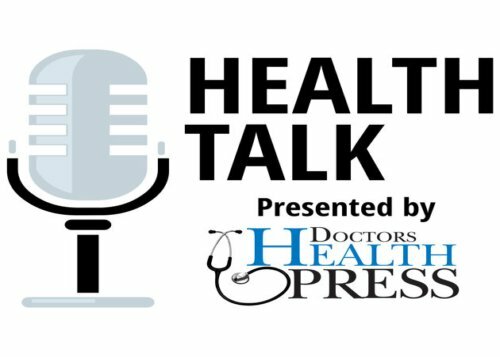 Thank you to all of our listeners for tuning in today to Health Talk by Doctors Health Press. And if you’ve enjoyed this podcast, since we are brand new, this is only our second episode, we would really appreciate it if you would give us a review. So if you’re listening on either itunes or Google play or anywhere else that you see below where you’re listening, that you’re able to give us a star rating or review, please do so. We would love to hear from you, love to hear what you think, what you like, what you don’t like, and that’ll really help us out. So if you’ve enjoyed this podcast and you want to stay up to date with more of the latest from Doctors Health Press, you definitely want to go over and sign up for the Doctors Health Press ebulletin. This is our free daily email letter and it’s full of great alternative and natural health advice. And its delivered to your inbox every morning, you don’t want to miss out on this. It’s got the latest news, latest research and it’s definitely informative. If you’re looking for something to help boost your health, don’t miss out. It’s free. It’s delivered every morning. What more can you ask for? So, you can sign up for this e-letter a on our website at doctorshealthpress.com. And as a special promotion for all of our listeners today, we’re also offering one of our Doctors Health Press publications at a discounted rate. Now, you definitely don’t want to miss out on this deal. You see our publications, are monthly newsletters that will really keep you informed about the latest in natural healthcare. So to see more about this special offer, just visit doctorshealthpress.com/podcastdeal. So once again, it’s doctorshealthpress.com/podcastdeal to learn more about this offer, until next time, I’m Sarah Cownley reminding you that it’s never too early or too late to live the healthiest life possible.